Most patients would love to have a hearing aid that they didn’t have to think about, whether it’s when they are getting ready for the day ahead of them or when they are going to bed at the end of the day. For the right patient, Lyric® hearing aids address a number of these concerns. Lyrics are extended wear hearing aids that are programmed to the user’s hearing loss and then placed 4 mm from the eardrum by their audiologist. The patient then wears the device 24/7 for up to three months at a time or until the battery dies. The device can be worn when showering, exercising, and sleeping, all activities where most standard hearing aid users remove their devices. Patients who lead an active lifestyle also appreciate not having to routinely remove, keep-track-of, and insert their devices. As regular replacements are needed, patients purchase an annual subscription to Lyric which covers their replacement devices as needed for the year. In addition to the convenience, the deep placement of the Lyric provides many users with cosmetic and sound quality benefits. It is 100% invisible, even to someone looking directly at the patient’s ear. The added fit and retention benefits allow the patient to wear their devices worry-free as the device cannot be knocked or brushed off. The deep placement also provides the patient with a more natural sound quality. 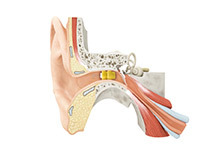 Traditional hearing aid microphones are placed either on top of the patient’s ear or at the ear canal opening. This eliminates many of the natural pinna cues that result from sound reflecting off the outer ear surfaces before traveling down the ear canal, cues that help an individual localize sound. The deep placement in the canal maintains these cues and provides Lyric users with improved directionality and localization. 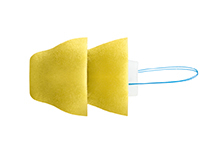 The deep insertion also minimizes the occlusion effect that many users experience with a standard in-the-ear hearing aid. As with any hearing aid, a patient needs a full evaluation in order to determine if they are a candidate for Lyric, both audiometrically and physically. If they are candidates, patients are also able to have a 30 day risk-free trial during which they can assess if Lyric fits their lifestyle and hearing needs in their daily life.